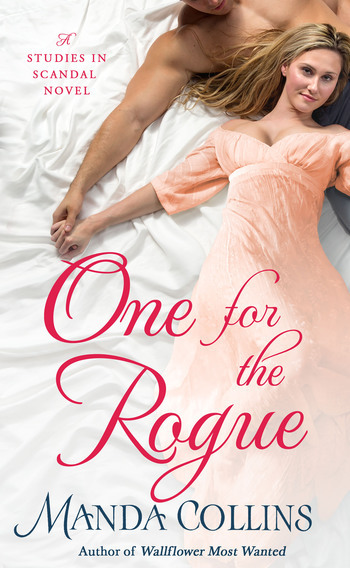 Two rivals join forces to solve a mystery, but might just find love, in One for the Rogue, the next thrilling novel in the Studies in Scandal series by Manda Collins. Geologist Gemma Hastings has no interest in pursuing romance—and no patience for Lord Cameron Lisle, an esteemed fossil hunter who has a way of always honing in on her territory. . .annoyingly handsome though he may be. But when a shocking attack puts Gemma in very real danger, she may have to accept Lisle’s offers of protection. Even if that means entering into a dangerous flirtation. . .
Lisle was once amused by Gemma’s dedication to her work. But now that he understands how much he’s underestimated her—a woman whose beauty is matched only by her genius—Lisle is desperate to prove his respect…and prove himself worthy of her. But is he too late? A bitter rival, desperate to steal Gemma’s scientific findings, is still at-large. Can Lisle help uncover the culprit and keep her safe—forever, in his loving arms? The hushed sounds of the quiet house accompanied Miss Gemma Hastings as she crept from her bedchamber through the hallways of Beauchamp House. Manda Collins is the author of The Lords of Anarchy series, The Ugly Duckling series and the Wicked Widows series as well as several other Regency-set romances. She spent her teen years wishing she’d been born a couple of centuries earlier, preferably in the English countryside. Time travel being what it is, she resigned herself to life with electricity and indoor plumbing, and read lots of books. When she’s not writing, she’s helping other people use books, as an academic librarian.